Map Town is a NOAA Certified Chart Agent. Map Town ensures that the charts are printed at the proper scale and quality to meet U.S. Coast Guard (USCG) chart carriage requirements. Only charts printed by a NOAA certified chart agent are accepted by the USCG as meeting chart carriage requirements for commercial vessels. No other raster chart format meets USCG carriage requirements. NOAA Chart 16601. Nautical Chart of Cape Alitak to Cape lkolik. NOAA charts portray water depths, coastlines, dangers, aids to navigation, landmarks, bottom characteristics and other features, as well as regulatory, tide, and other information. They contain all critical corrections published in notices to mariners since the last new edition of the chart was released, as well as any newly compiled routine changes. NOAA Chart 16003. Nautical Chart of the Arctic Coast. NOAA charts portray water depths, coastlines, dangers, aids to navigation, landmarks, bottom characteristics and other features, as well as regulatory, tide, and other information. They contain all critical corrections published in notices to mariners since the last new edition of the chart was released, as well as any newly compiled routine changes. NOAA Chart 16004. Nautical Chart of Point Barrow to Herschel Island. NOAA charts portray water depths, coastlines, dangers, aids to navigation, landmarks, bottom characteristics and other features, as well as regulatory, tide, and other information. They contain all critical corrections published in notices to mariners since the last new edition of the chart was released, as well as any newly compiled routine changes. NOAA Chart 16005. Nautical Chart of Cape Prince of Wales to Pt. Barrow. NOAA charts portray water depths, coastlines, dangers, aids to navigation, landmarks, bottom characteristics and other features, as well as regulatory, tide, and other information. They contain all critical corrections published in notices to mariners since the last new edition of the chart was released, as well as any newly compiled routine changes. NOAA Chart 16006. 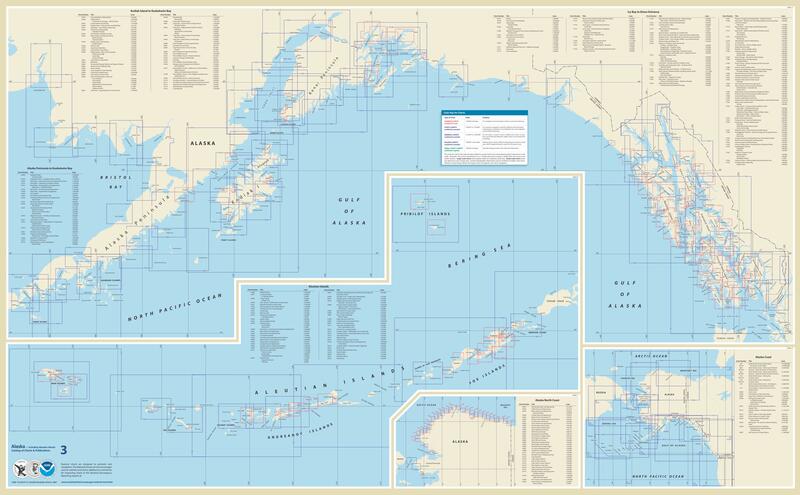 Nautical Chart of Bering Sea-eastern part - St. Matthew Island, Bering Sea - Cape Etolin, Achorage, Nunivak Island. NOAA charts portray water depths, coastlines, dangers, aids to navigation, landmarks, bottom characteristics and other features, as well as regulatory, tide, and other information. They contain all critical corrections published in notices to mariners since the last new edition of the chart was released, as well as any newly compiled routine changes. NOAA Chart 16011. Nautical Chart of Alaska Peninsula and Aleutian Islands to Seguam Pass. NOAA charts portray water depths, coastlines, dangers, aids to navigation, landmarks, bottom characteristics and other features, as well as regulatory, tide, and other information. They contain all critical corrections published in notices to mariners since the last new edition of the chart was released, as well as any newly compiled routine changes. NOAA Chart 16012. Nautical Chart of Aleutian Islands Amukta Island to Attu Island. NOAA charts portray water depths, coastlines, dangers, aids to navigation, landmarks, bottom characteristics and other features, as well as regulatory, tide, and other information. They contain all critical corrections published in notices to mariners since the last new edition of the chart was released, as well as any newly compiled routine changes. NOAA Chart 16013. Nautical Chart of Cape St. Elias to Shumagin Islands - Semidi Islands. NOAA charts portray water depths, coastlines, dangers, aids to navigation, landmarks, bottom characteristics and other features, as well as regulatory, tide, and other information. They contain all critical corrections published in notices to mariners since the last new edition of the chart was released, as well as any newly compiled routine changes. NOAA Chart 16016. Nautical Chart of Dixon Entrance to Cape St. Elias. NOAA charts portray water depths, coastlines, dangers, aids to navigation, landmarks, bottom characteristics and other features, as well as regulatory, tide, and other information. They contain all critical corrections published in notices to mariners since the last new edition of the chart was released, as well as any newly compiled routine changes. NOAA Chart 16041. Nautical Chart of Demarcation Bay and approaches. NOAA charts portray water depths, coastlines, dangers, aids to navigation, landmarks, bottom characteristics and other features, as well as regulatory, tide, and other information. They contain all critical corrections published in notices to mariners since the last new edition of the chart was released, as well as any newly compiled routine changes.